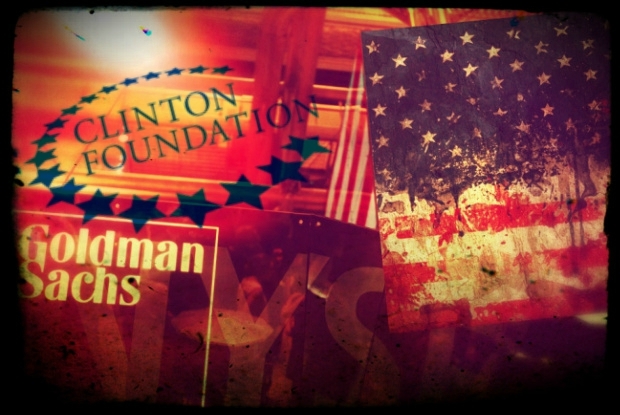 The cozy relationship between Goldman Sachs and the Clintons has reached dizzying new heights in recent years, giving the Democratic Party nominee Hillary Clinton an immensely influential partner on Wall Street. As the public and most of the mainstream media is still processing the political bombshell concerning the newly reopened FBI probe into the Hillary Clinton’s email server case – the global investment banking firm Goldman Sachs quietly endorsed the Democratic presidential candidate this past week. While campaigning for his first term in the White House, former president Bill Clinton received an enormous amount of support from Washington insider lobbyists and investment banking firms on Wall Street. By now, there should be little doubt that the Clinton political machine is a wholly owned subsidiary of the Wall Street banking cartel. Their relationship was built over three decades. BLANK CHECK: Bill Clinton laughs with Wall Street elites after signing the Financial Services Modernization Act in 1999. In one of the most significant financial rulings in the modern era, the Clinton presidency gave big banks like Goldman Sachs the skeleton key to the kingdom by deregulating the investment banking system almost entirely. The Clinton/Goldman Sachs/Wall Street partnership was fully forged after the removal of the Glass-Steagall Act, which banking luminaries cynically named the “Financial Services Modernization Act of 1999″ officially titled the Gramm-Leach-Bliley Act. The original Glass-Steagall was a depression-age four-part provision under the Bank Act of 1933 that strictly prohibited securities activities that could be harmful to investors – the same sort of rogue speculating and paper fiat fraud which triggered the Great Depression (1929-1941). In fact, the Gramm-Leach-Bliley Act which repealed Glass-Steagall, opened the door for the ‘shadow banking’ realm outside of regulatory oversight which led to a much higher trading risk, as banks became more interlinked. Simply put: Clinton’s repeal of Glass-Steagell removed the firewall between speculative investment banking and regular high street retail and consumer banking – which exposed everyone to toxic, subprime ponzi schemes and fake paper products being pushed around the globe by the banking elite – which ultimately causing the global economy to crash in 2008. All that can be laid at the feet of one William Jefferson Clinton. And Hillary still claims that, “My husband did so well with the economy.” Really? Prins has become an advocate for the reinstatement of the Glass-Steagall Act since departing from the investment banking world. Then, in 1998, in an act of corporate civil disobedience, Citicorp and Travelers Groupannounced they were merging. Such a combination of banking and insurance companies was illegal under the Bank Holding Company Act, but was excused due to a loophole that provided a two-year review period of proposed mergers. The merger was premised on the expectation that Glass-Steagall would be repealed. Citigroup’s co-chairs Sandy Weill and John Reed led a swarm of industry executives and lobbyists who trammeled the halls of Congress to make sure a deal was cut. At the time, it was the largest financial merger even though it was technically illegal, as stated by the former Bankers of America CEO Kenneth Guenther. In 1999, after “12 attempts in 25 years,”Congress passed the Financial Services Modernization Act, which led to the repeal of Glass-Steagall. They laid out more than $290 million for lobbying in 1998, according to the Center for Responsive Politics, and donated more than $150 million in the 1997–98 election cycle—a figure sure to be topped in 1999–2000. How much of those contributions made their way to the Clinton family and what kind of impact did this have after they left the White House? In 2005, Bill Clinton was paid over half a million for speaking at three private Goldman events. In 2013, after stepping down from her position as Secretary of State, Hillary Clinton gave a total of three paid speeches at Goldman Sachs events to the tune of $675,000 dollars, in which one attendee said “she sounded more like a Goldman Sachs managing director,” according to a quote obtained by Politico. Indeed, Clinton gave a glowing speech to the Goldman gang and in the process, as Wikileaks released in early October, the Democratic nominee believes in “both a public and a private position” on Wall Street reform and that it is an “oversimplification” to suggest that investment banking led to the most recent financial crisis. That Clinton leak provided another window into the much protected alliance between finance and politics, but it’s only the tip of a much larger iceberg. ‘ANOINTED’: Chelsea Clinton with Goldman Sachs-backed hedge funder Marc Mezvinsky. The Clinton family is chock-full of banking connections, as Chelsea Clinton ‘joined’ the Avenue Capital Group, which according to reports is a “…$12 billion hedge fund whose founder has contributed to many Democratic Party campaigns.” Chelsea is married to Marc Mezvinsky, a former investment banker for Goldman Sachs. Chelsea’s tenure at Avenue Capital Group was from 2006-2008 just prior to Hillary Clinton’s run for president in 2008. Since then Chelsea has risen to vice chairman inside the Clinton Foundation. Marc Mezvinsky was forced to close one of his hedge funds recently, Eaglevale Hellenic Opportunity, after had the fund lost most of its initial investor funds of $25 million – after blowing the money on secondhand junk Greek bank stocks and toxic government debt. As it turns out, Marc is the son of troubled former Congressman Ed Mezvinsky – another close friend of Team Clinton. In the waning days of Clinton’s presidency, federal prosecutors and the FBI were bearing down on former Rep. Ed Mezvinsky (D-Iowa), who had fallen for a series of Ponzi schemes and pulled in nearly $10 million money from other investors to cover his losses. …records released last week by the Clinton Presidential Library in Little Rock and obtained by POLITICO show Mezvinsky and his then-wife — ex-Rep. Marjorie Margolies-Mezvinsky (D-Pa.) — pleaded with the former president for a presidential pardon to head off the looming federal case. Chelsea Clinton’s husband and his partners have suffered a huge loss after trying to bet on the revival of the Greek economy, and are now being forced to shut down one of their hedge funds. Marc Mezvinsky, 38, and his partners, former Goldman Sachs colleagues Bennett Grau and Mark Mallon, raised $25million from investors to buy up bank stocks and debt from the struggling nation. That fund however has lost 90 percent of its value, investors with direct knowledge of the situation told The New York Times, and will now be closed. The Clintons’ relationships with Wall Street deepened in the 2000s, when Mr. Clinton set up his foundation in Harlem and Mrs. Clinton was elected to the Senate from New York. That brought her in close touch with the big Wall Street firms, a source of jobs and tax revenue for New York — and a leading source of campaign funds for Mrs. Clinton. During her years in Congress, employees of Goldman donated in excess of $234,000 to Mrs. Clinton, more than those of any other company except Citigroup, accordingto the Center for Responsive Politics. Along with other New York politicians, Mrs. Clinton worked to obtain federal tax breaks to resuscitate Lower Manhattan after the Sept. 11, 2001, attacks, and those breaks helped Goldman build its new, roughly $2 billion headquarters. When it broke ground in 2005, Mrs. Clinton and other New York officials were on-site. To understand who powers the Clinton Foundation’s billion dollar RICO influence-peddling slush fund, you need to understand how money is laundered between Wall Street and Washington DC. Goldman Sachs will pay $5 billion to settle federal and state probes into the bank’s sale of mortgage-backed securities before the financial crisis, the Justice Department announced Monday. Authorities said Goldman misrepresented the quality of loans it securitized and then sold to investors ahead of the housing bubble and 2008 crisis. The settlement includes a $2.4 billion civil penalty, $1.8 billion in relief payouts to underwater homeowners and affected borrowers and $875 million to resolve various other claims. This resolution holds Goldman Sachs accountable for its serious misconduct in falsely assuring investors that securities it sold were backed by sound mortgages, when it knew that they were full of mortgages that were likely to fail,” acting Associate Attorney General Stuart Delery said in a statement. All told the Clinton friendly investment giant Goldman Sachs (after making record profits) became the fifth mega-bank ordered to pay billions to the Department of Justice after the financial crash of 2007-2008. In addition, the firm was ordered to pay $3 billion to the Federal Housing Finance Agency in 2014 – not including pending private lawsuits levied on the firm since the Great Recession. 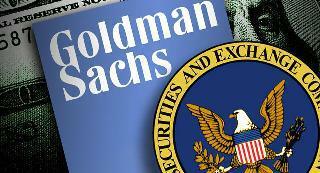 Data gathered mostly from the Corporate Research Project, a public interest website, show that on thirteen occasions between 2009 and 2016, Goldman was penalized by US courts or government agencies for fraudulent or deceptive practices that were committed mostly between 2006 and 2009. The Clinton connection to Goldman Sachs emerged in the early 1990’s as Robert Rubin, a former senior partner with Goldman (with a 26-year tenure with the firm), joined former President Clinton’s economic policy team, later becoming Secretary of the Treasury in 1995. Around that time, the Clinton presidency ushered in soaring tax hikes under the ‘Rubinomics’ banner (aka Clintonomics), the plan raised taxes on most Americans, specifically the middle class, in what was said to be the largest increase in American history at the time. During the Clinton Administration, Treasury Secretary Robert Rubin, who had run Goldman Sachs, enthusiastically promoted the legislation. In a 1995 testimony before the House Banking Committee, for example, Rubin argued that “the banking industry is fundamentally different from what it was two decades ago, let alone in 1933. … U.S. banks generally engage in a broader range of securities activities abroad than is permitted domestically. Even domestically, the separation of investment banking and commercial banking envisioned by Glass-Steagall has eroded significantly. When it collapsed, due in part to bank-friendly policies that Rubin advocated, he made more than $100 million while others lost everything. “You have to view people in a fair light,” says Phil Angelides, co-chair of the Financial Crisis Inquiry Commission, who credits Rubin for much of the Clinton-era prosperity. “But on the other side of the ledger are key acts, such as the deregulation of derivatives, or stopping the Commodities Futures Trading Commission from regulating derivatives, that in the end weakened our financial system and exposed us to the risk of financial disaster. If Comey, and his boss Attorney General Alberto Gonzalez, had made a different decision about KPMG back in 2005, KPMG would not have been around to miss all the illegal acts HSBC and Standard Chartered SCBFF +% were committing on its watch. Bloomberg reported in 2007 that back in June of 2005, Comey was the man thrust into the position of deciding whether KPMG would live or die for its criminal tax shelter violations. A new update on the FBI investigation into the Clinton Foundation was announced over the last 24 hours, in addition the recently reopened Clinton email probe from last week. It remains to be seen how in-depth this new investigation will be. To call it collusion would be an understatement. When looking back at the financial affairs of the Clintons, Goldman Sachs and others on Wall Street – it’s clearer than ever that what we are looking at is a criminal syndicate.